For Caravan Storage Gold Coast - Oasis offers an excellent facility; we'll take care of your precious caravan boat or motorhome! Finding vehicle storage on the Gold Coast is fairly easy, but finding a safe and secure facility can be more difficult. While many companies offer a place to store your item, generally there are clauses attached to your contract that can be tiresome, to say the least. So, rather than using these places, some Gold Coast residents often opt to leave their vehicle in their garage, taking up valuable space. Or, even worse on their lawn, what an eyesore! If this issue sounds familiar, be sure to check out the Gold Coast’s newest storage centre. At Oasis we offer safe and secure storage options with features galore! For secure yet cheap caravan storage - Oasis ticks all the boxes! With Oasis Storage, your caravan, motorhome, trailer or boat will always be safe. We can also cater for all your unused household items too, don't live in clutter...de-clutter today! Free up more space for the important things. Oasis let you choose how long you need storage space for, so, no long term lock in contracts. Also, we offer other great features for customers to use. For example, we have a store where you can buy locks, boxes and tape, along with other moving supplies. We also provide a boat and caravan cleaning service. So as you can see, Oasis Storage gives great value for less money! 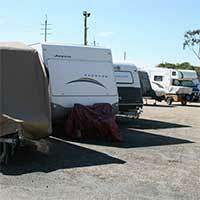 Find out today how to store your caravan safely. Finally, you can remove it from your lawn! For storage at fantastic prices - Call Oasis today, or pop in for a chat and more info - We'll take care of your Caravan, Motorhome, Trailer and all other personal items. At last, a Gold Coast storage facility focussed on providing a first class service to suit all budgets.